'Yarn Bombing' image courtesy of Wiki. LANCASTER – The 27th annual Antelope Valley Union High School District Student Art Exhibition will display at Lancaster City Hall from April 5 – May 20, 2012. The exhibition will open with a free public reception from 5 to 7 p.m., Thursday, April 5, with more than $1,000 in cash awards presented to student artists. The exhibition encourages and supports the artistic experimentation and expression of the Antelope Valley’s next generation. Featuring more than 120 pieces of artwork from over 100 students within the school district, the exhibitors were selected by art instructors from Antelope Valley, Desert Winds, Eastside, Highland, Lancaster, Littlerock, Palmdale, Pete Knight, Quartz Hill and R. Rex Parris High Schools. The exhibition includes a wide variety of media such as oil, ceramic, watercolor, photography, acrylic, plaster, charcoal, pencil, scratchboard, color pencil, computer art, pastel and mixed media. Motivated by the yearly donation of knitting needles, crochet hooks and yarn to the school by Michaels Arts and Crafts Stores, Carpenter decided they needed to “yarn bomb” together. 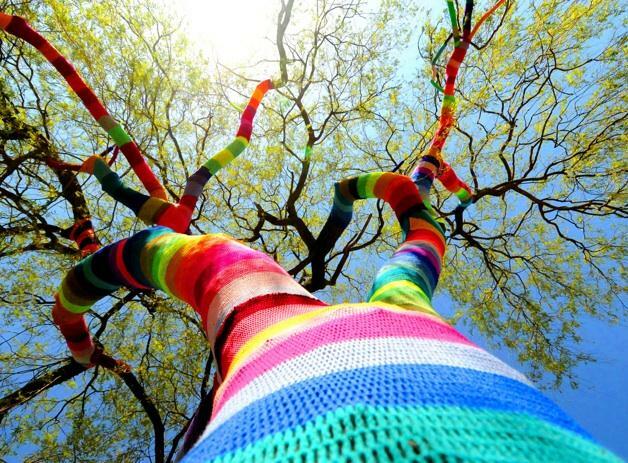 After viewing images of the yarn bombing craze on the internet, both instructors and students were hooked on the concept. They decided to “Yarn Bomb” the Lancaster City Hall Plaza for the opening of the event. Carpenter will be joined by the Lancaster MOAH staff and Los Angeles based artist Nicola Vruwink—one of the pioneering artists responsible for starting the ‘Yarn Bomb’ concept ten years ago—in directing the students on this public art project. The “yarn bombing” students are scheduled to install their yarn creations in front of Lancaster City Hall from 8 a.m. to 2 p.m. , Wednesday, April 4, the day before the opening reception. Community members with knitting and crocheting experience are invited to participate on April 4. The Lancaster Museum of Art & History (MOAH), in conjunction with the AVUHSD, is presenting the event. For more information, contact the Lancaster MOAH at 661-723-6250.